San Pedro Martir to The Lighthouse Finisterre. Our last day, back to the Chapel of San Pedro where the marquees were still up but deserted, the chapel still locked and only a fountain that didn’t seem worth taking shoes and socks off for. But the light as dawn was breaking was excellent and the multiple levels of cirrus clouds were lit by the pink rays of the early sun with, as the guidebook said, panoramic views over to the Cape Finisterre. The route followed the coast road in several places after descending into Cee, the local main town, and gently rose and fell over the two headlands prior to the beach at Finisterra. En route we met a man tending the apples in his orchard. He gave us some small peaches which were windfalls from his trees and talked about how the apples from his orchard were sent to Asturia to be turned into cider. The Somerset pilgrim was able to say that he also came from a big cider making region but there the stilted conversation stopped. We stopped for coffee at the camp site we had being staying at and reached Finisterre lighthouse about 1445 after a good lunch in one of the many little restaurants in the town. As we arrived pathetic fallacy again took over and after a fine morning the wind and rain picked up, nonetheless your stout hearted pilgrims climbed down the cliffs to the place where countless others have burnt their clothes and other items, and burnt our shoes that have stood the rigours of the Camino fairly well since their purchase in Lourdes, but were now becoming very well worn. After getting our final sello (stamp) from the lighthouse, we returned to Finisterre pilgrim albergue to receive our certificates to mark the completion of the walk out to ‘The End Of The World’. Jane adds: it’s very nice to have my husband back, after all that walking. Even better that he should burn the shoes, as I’m not sure I wanted to share the tent with them for any longer! This will be the final post to this blog site (‘thank ****** for that’ cries out our loyal readership!). We have not formally attempted to do any fund raising on this trip, so if you would like to applaud our efforts, please make a suitably sized donation to a charity of your choice. We have been walking towards the end of the known world now for two days, pathetic fallacy cut in as we arrived on the camp site in Estorde, nearly at Finisterre. We have elected to transfer our base to this remote part of Galicia and to walk on a daily basis until we reach the point of land most westerly in the known world. The problem is that it isn’t! Looking at the map today we realised that Lisbon in Portugal is at least as far westerly as the Capo Finisterre owing to the magic of Mercator’s projection and the position of the north pole re latitude and longitude, although grid lines on some Spanish maps help continue the myth of the Finisterre. The countryside through which we walk is typical west of Ireland; there is gorse and broom and heather. It is green, and as we know you don’t get green without rain. The night before last and yesterday were dominated by a small deep depression that formed off the coast, and a gale and wind equal to any in the western Scottish Isles. We survived and are now about halfway between Santiago and Finisterre. Our pace has slowed as we now are accompanied, but allows appreciation of some more sedentary values. On stopping yesterday for mid morning coffee at a tiny bar in the middle of nowhere we were pressed to accept a slug of (probably rum) in our coffee, “for the taste, and the journey”, such is hospitality still in the remote parts of the Way. The land is very rural, farms and small hamlets only. A sculpture in Negreira depicts a Galician family with the father leaving to find work, but his feet are the roots of a tree. Echoes of Scotland, Ireland and other Western Celtic lands are all around, only the ever present alien Eucalyptus tree and the huge wind farms with their turbines strike a strange note, the mists, damp, and wind are familiar. 03.08.08 Wednesday.Santiago de Compostela. We have been in our cosy little appartement in Santiago for 2 days now, small but comfortable as long as everyone breathes asynchronously. We have all done the cathedral, pilgrims twice, and the museum of peregrinations, there is a phenomenal amount of carved stone around the town as well as on the cathedral, if old buildings and wood and stone carving are your thing then this place is well worth a visit, the thousand years of pilgrimage to the reliquaries of St James even if the story was almost certainly manufactured have produced a town full of the efforts of human endevours. In several places the old and the new have been put together with a degree of sensitivity unusual in any cities today. It is also very used to visitors and you could probably find someone to try to understand you even if you only spoke Martian! We have not had any sun since arriving here and last night a significant amount of rain. We have eaten out mostly and there are a huge number of eating establishments, notable mentions for Café Conga rue de Conga, coffee con letche 1 euro with fresh orange juice and a mini croissant thrown in free, and Casa Monolo in Plaza de Cevantes possibly the ultimate pilgrim eatery with big portions for 8.5euros for the standard 3 courses with wine and certainly a place where you are likely to meet as we did many people we had met along the Way. Tomorrow we start for Finisterre and in keeping with our experience so far the rain should stop as maybe it does not fall on the righteous? At large in Santiago de Compostela. Yesterday when we received our Compostelas we had to state whether our journey was religious, spiritual or secular. One of each of us replied secular and spiritual, neither having a true feeling of a higher call to Santiago. 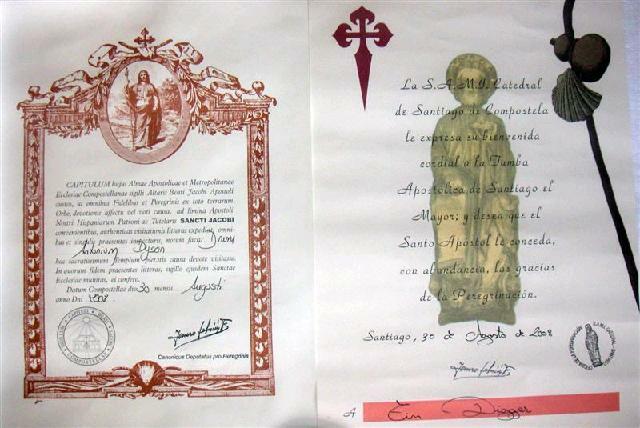 We received different documents both attesting to our arrival date in Compostela, one in Latin the other in Spanish. What the religious one is like we don’t know not having seen one. This morning about 1000 we visit the cathedral, the front of the building has no fewer than three statues of St James, one as pilgrim and two clones of the apostle. There was a service in progress but no one minds as pilgrims wander round and are shepherded by ushers into filing past the silver reliquary possibly containing the bones of St James in a crypt and then up behind the statue of St James on the altar to embrace and touch and help polish the orb of gold on which he is standing. It is quite moving to stand at last as hundreds of thousands have done before over the centuries after making their journeys, often at considerably more risk and hardship than ourselves. The huge censer (incense burner), the famous ‘Botafumeiro’ that the cathedral is famous for, was not in action but hanging over the priests as the service took place. This is made of silver, weighs nearly 80kg and takes a team of 8 men and a system of pulleys to set it in motion. It swings at ceiling level from one end of the transept to the other. Let us hope that the rope never breaks! The organ played to accompany the service. It is huge with a beautiful tone and outside we listen to three street musicians playing Pachelbel’s Canon and a piece by Rodrigo, on flute, guitar and mandolin. The street musicians that play in places around the city must be well regulated they are all of a high standard and appear to have a set pitch and time for their playing. Later today we have secured a small self catering apartment close to the middle of the old town and settle in to do washing and house keeping chores, before the arrival of our wives tomorrow. The weather is still cloudy and cool. Arzua to Santiago de Compostela. The brief flurry of rain yesterday became a full thunderstorm that grumbled and muttered all night with intermittent heavy showers on the roof over our heads. We set off at half past six in light rain that soon got heavier, this seemed to put many people off as we had the Camino to ourselves until 0900 when the rain stopped and people started to appear from albergues. The little almost empty streams that cross the Camino were swollen with the rain and once we resorted to the old French trick of walking in the adjacent field (this time we didn’t end up knee deep in water) and generally bowled along happily no more than a bit damp under our waterproofs. We passed quite a few private albergues and by mid morning it was obvious that we were going to get to Compostela today. We reached Monte de Gozo, the hill outside Santiago from which the cathedral should be visible, about 1200h. This is the place where in the Holy year of 1993 (a holy year is when St James’s day, 25th July falls on a Sunday) a huge 800 bed albergue was built to accommodate those travelling to Compostela to celebrate the papal visit of John Paul II. The albergue remains together with a large sculpture with several well done panels depicting the pope and the routes to Santiago. We walked rapidly on to a small albergue in a residential area of the town checked in and went rather hungrily to find lunch, in a pizza parlour next door to McDonalds! Qh well! After a much needed shower to remove mud we then went into town to queue for a short time to present our completed credencial (pilgrim’s passport), to get our Compostela. This is the certificate awarded to those reaching Compostela and having walked at least 100 kilometres (or 200 if arriving by bicycle or horse). Tomorrow we will spend a few days visiting the city prior to our departure for Finisterre. Palas de Rei to Arzua. Out of town at 0630 and strolling over the Galician countryside in the dark as usual a slower pace than usual gets us to Melide a pleasant looking large town with a museum in an old pilgrim hospital by 1000. Unfortunately as the museum does not open for several hours we press on with our usual coffee stops at the now relatively common bar/coffee shop/albergues along the way. This is a part of the route that is well travelled, even crowded at this time of year, though the bike pilgrims do not hit the road as early as the foot sloggers. The way is still very rural although often within earshot of a main road although this is not yet obtrusive. We move easily along green lanes many lined with eucalyptus trees. There are quite a lot of cows about and one feature of the area not mentioned before are the horreos. These are maize and potato storage buildings. Most of these are small, typically less than 5m by 2m but may be found up to 20m long. They are raised up on legs often above walls or gateways with anti rat overhangs on the legs to prevent the precious cattle feed for the winter being consumed before use. These are very largely obsolete but seem to have become essential features of some houses in the area. We gain an additional stamp for our passports as we are invited into the small village church in Boente (dedicated to St James naturally) by the padre as we cross the road next to it. Impossible to refuse, it has a full set of statues of ‘the man’ in his various guises. Coming through Ribadiso there is a lovely refugio down by the river that has been converted from the old pilgrim hospice, but we have still got a few kilometres to go so we press on. We climb the final hill and arrive in the long main street of Arzua just after 1200 with storm clouds gathering and occasional distant lightening flashes. We place our rucksacks at the end of a lengthening queue for the 40odd places in the Municipal albergue. At the last minute just before doors open at 1300 the cloud burst starts causing a flurry of waterproofs and umbrellas. When our turn arrives Tony is delighted to discover that well over half of the pilgrims before us are older than him, the municipals collect age data of pilgrim users for some reason. There are many shops and café/bar restaurants in town. We must be nearing the coast as octopus (Pulpo) features on many menus. We have a good lunch and the customary siesta away from the heat that has returned with force after the cooling shower. Only two days (40k) to go to Santiago. Portomarin to Palas de Rei. Not a day when a lot happened. We got up, pursuing our Greek diver peregrino out of the hostal at about 0600 and wandered up the hill out of town having first crossed a footbridge over an arm of the reservoir. This was made of welded steel plates which moved in the darkness which Jane certainly would not have coped with. We continued to amble along, having only 25km to cover, through deep rural Galicia, passing through the mists that seem to be a feature of early morning here at this time of year. Cockerels crow and occasionally dogs bark but much less so that in France where our passage often incited the whole neighbourhood to frantic barking. The dogs are also seldom shut up or chained and mostly lie there in a stupor, possibly opening an eye to watch us pass. The villages that we pass through are all rather small but there do seem to be café/bars on a fairly regular basis so you are never too far away from your next caffeine fix. One hamlet even had a table with coffee making stuff on it and a ‘donations’ box. Each village and hamlet seems to be filled with old farm machinery; carts hay cutters etc. It is not clear when these were last used , if indeed they have been pensioned off, as their modern replacements are not immediately obvious. The countryside undulates its way up to about 700m and drops down again to the town of Palas de Rei art about 550m. We arrive at 1200 and the albergue opens an hour later, after a beer or two. There is nothing else to do in town even the church is small and relatively uninspiring. In the afternoon we watch the locals waiting for a bus and the destruction of the concrete surface of a public area by large concrete smashing machines. They must be in a hurry as there was hardly a pause for siesta. Fortunately Tim has managed to find a book to read in English or we really would have a problem! Both albergues in town have filled up by late afternoon so this must be a bit of a choke point on the surge onwards to Compostella. Samos to Portomarin via Sarria. The albergue in Samos filled up completely very late on and took a long time to settle for the night with 50 plus people in one room. We were first out of the door after a not too good night sleep (for Tim), but hey, how often do you get to sleep in a monastery, to eat our breakfast (pastries and fruit juice) in the bit of a garden on the other side of the road where the washing dried yesterday. As we walked out of Samos it was obvious that at about 500m we were in the clouds that yesterday morning had been so impressive, not cold just clammy, with water particles visible in our head torch lights. It was an up and down day mostly following farm tracks over about 38 kilometres with a final descent of 300m down to the Embalse de Belezar reservoir on the Rio Mino. This river via at least one more sizeable reservoir makes its way to the Atlantic after it has served as the border between Spain and Portugal. We cross the bridge over the reservoir to the bottom of the town of Portomarin and climb a steep (well it felt steep) flight of steps up to the Albergue. One of the modern privately run Red Albergues that are present sporadically across the Camino, they are clean and well run and cost about 8€ per night usually in small 4-6 bedded rooms. We meet a Greek ex commercial and still keen amateur diver (Tim and he natter for ages). Portomarin is a relatively new town as it was built after the river was dammed in the 1960s. The Romanesque church of San Nicolas was moved stone by stone to its present location in the centre of the town before the valley was flooded. Also in town is the baker who makes the famous ‘Torta de Santiago’ which is a large plate sized almond tart decorated with the cross that is a combination of a sword and a shepherd’s crook. Bob Simpson brought one of these back from Compostella airport on one of his travels last year for Tony and it was enthusiastically devoured at Christmas. Fortunately they do seem to remain edible for some length of time. We now have 4 easy days to cover the remaining 90km to Santiago de Compostella. Starting as usual in the dark we begin a 600m plus descent with a few ups and downs and then a steady, steep in places, descent into Triacastera, through countryside that would not be out of place in the Pennines except the views are longer and more distant. There are two views of clouds in valleys, one stretching for tens of miles with hills poking up through it. The descent is hard on the legs but eventually we end up alongside a small river in a valley not unlike Dovedale with multiple small weirs controlling water for irrigation or old disused mills. Eventually, after what seems a longer distance than the guide book or tourist info says, suddenly we emerge from trees and there is the Benedictine monastery of Samos. On the way we chat with a Dutch couple pulling devices like golf carts with harnesses. They have walked from Holland starting on the 1st of May. We compare journeys but all agree it’s a long way. The carts it seems work well but they try to stay on better tracks or roads where possible. The Albergue in the monastery opens at 1500 so we dump our packs and head to the bar opposite for lunch. We later find the town consists of a very large monastery (with very few monks), and a lot of bars selling food to pilgrims. There seems little else. However there is a trip around the monastery and we do this. It was probably founded in the 6th century, abandoned in the Moorish invasion and restarted in the 8th century. Variable fortunes over the centuries with multiple fire and rebuilds mean little original survives but the frescoes, from the last rebuild by living artists, of the life and times of St Benedictine are good. We only have a few days left but the Camino continues to surprise and delight. 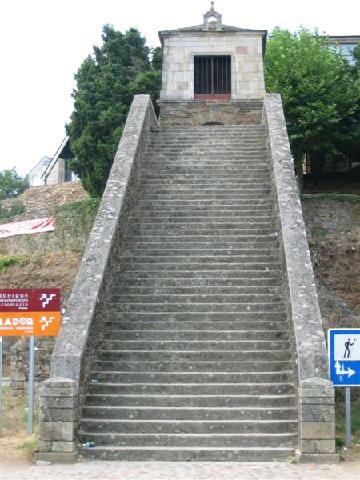 What a great day, we enter Galicia almost at the top of climb to the small settlement of El Cebreiro. There are three options for the route on this section, the obvious old Camino up the floor of a steep sided valley, following the old main road either on it (mostly protected now by a concrete crash barrier) or at the side of it, in places upon even older roads, but all tarmac, is the one we take. The two alternatives that go up the sides of the valley and into very small villages on either side are significantly longer and add a deal of height to a day that is already planned to be 30km with an 800m ascent at the end. The real clincher is that in daylight yesterday we could not find the way out of Villafranca to the first village of Dragonte so we elect to follow the classic route up the valley bottom. There are bars open to provide coffee and breakfast after a few kilometres and the motorway from Madrid to La Coruna criss-crosses our way usually high overhead on some quite impressive viaducts and occasionally underground through short tunnels. Eventually it peels off to the north. The road gets smaller and smaller with a sense of gradually travelling back in time, going up a valley that gets steadily greener and more like England. There are cows grazing in green fields and a small clear stream runs beside the way until we cross it across a bridge reputed to have existed since Roman times. It is in remarkable repair and much daily use, some of the stones are probably original but it cannot be 2000 years old. After Las Herrerias and the site of a previous pilgrim hospital (known as the Hospital Ingles), the ascent steepens and we manage to produce sweat due to exertion, a phenomenon not seen for many days. There are some superb views looking back to the east and the vegetation is now broom and heather not unlike the Lake District. We pass the marker stone (2metres high) on the border between Castille y Leon and Galicia and are pressed into service as photographers by a happy Italian family. From here on there are marker stones every 500 metres telling you how far there is left to go to Compostella (150 kilometres at the border stone), so hopefully we shouldn’t get lost from here on. We have met many Italians along the Camino always noisily cheerful. Many have done the trip starting at Roncevalles just in Spain on the Pyrenees. There are also Germans and Danes, and today several ladies from Sweden. The top is the small village of O Cebreiro, with a reconstructed Celtic settlement consisting partly of pallozas which are round thatched dwellings. There is also an Albergue and quite a lot of other accommodation, taxis arrive by road (a disappointment one feels it should be foot pilgrims only up here) bringing those starting or taking away those whose time on the Camino is too short to finish in the time they have away from their work all around Europe and indeed the world (party from South Korea yesterday). As we wait beside our fellow pilgrims for the albergue there are stunning views of the mountains of Galicia to the north and west and we see these again through the open window on to the terrace from the men’s shower room, as Tony said “I’ve never had such a good view stark naked before!”.